Most of us have a lot of fun and unforgettable experiences as a child. No matter how we may have spent our childhood, these moments will contain fond and precious memories which we can look back at and feel nostalgic about. If you’re interested in looking back at this time of innocence, freedom, and adventure, then we have the perfect show for you! 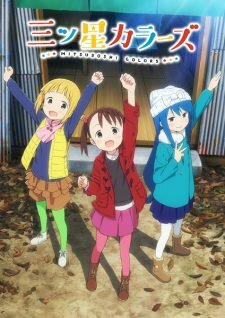 Mitsuboshi Colors (not to be confused with the car brand) is an adaptation of the manga by Katsuwo. 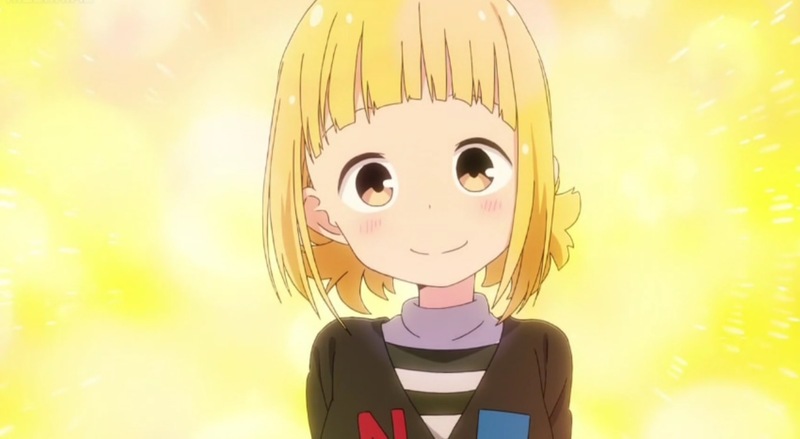 It is an episodic comedy and slice of life anime produced by the studio Silver Link, who have also produced similar, amazing titles such as Non Non Biyori, Tanaka-kun is Always Listless, and Anne Happy, among others. It started airing on January 7, 2018, and has just finished airing its final episode last March 25, 2018. 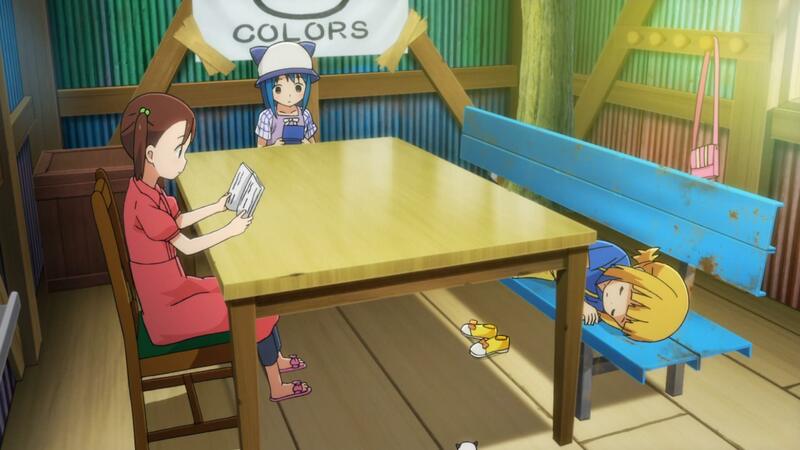 In this anime, we follow these adorable group of children, Colors. It is an organization which they have formed in order to keep their town peaceful. 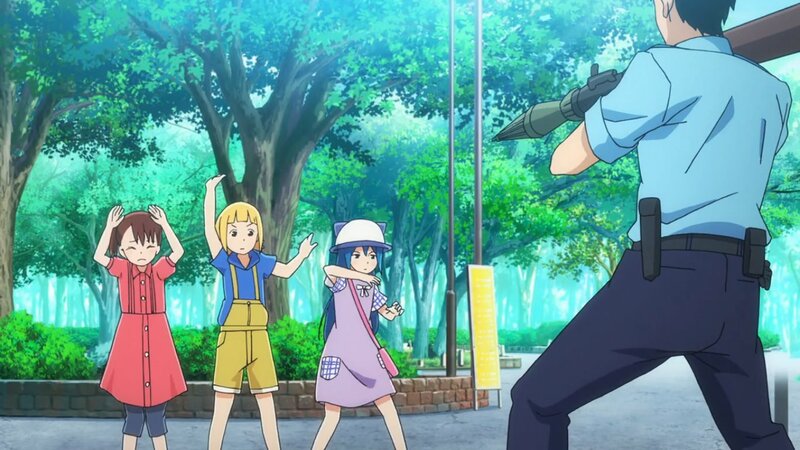 We join this reliable trio as they… defuse a bomb?! Catch a burglar?! Look for treasure?! Well, technically yes, but not really. In these children’s imaginative and active minds, this might be the case. But for us viewers, we are just here to watch them have fun as they play and find ways to solve miniscule problems of the people in town. Colors is a group of three young girls, each with completely different personalities. 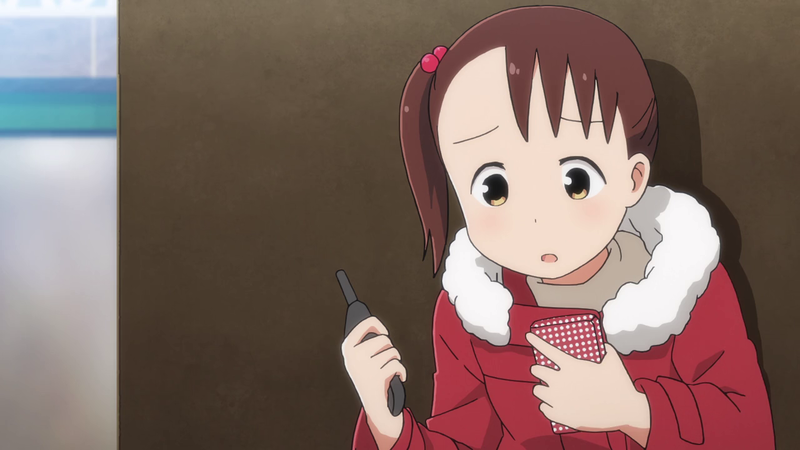 First off, we have “Colors Red”, Yui. She is the leader of the group, although she is timid and tends to cry when problems arise for them. She is usually the only one who worries when they encounter dangerous situations, and tries (but horribly fails) to act as the tsukkomi (straight man) of the group. Next up, we have “Colors Yellow”, Sacchan. In contrast with Yui, she is very quirky and energetic, and is the one who makes puns and jokes which leaves the others laughing. She is usually the one who just goes and runs around to pursue things that she finds interesting, so the other two would end up following her. Last, but not the least, we have “Colors Blue”, Kotoha. She is the “brains” of the group, as she is very clever and cunning. More likely than not, we’d see her holding and playing with her handheld console, sometimes even while they’re running around the town. 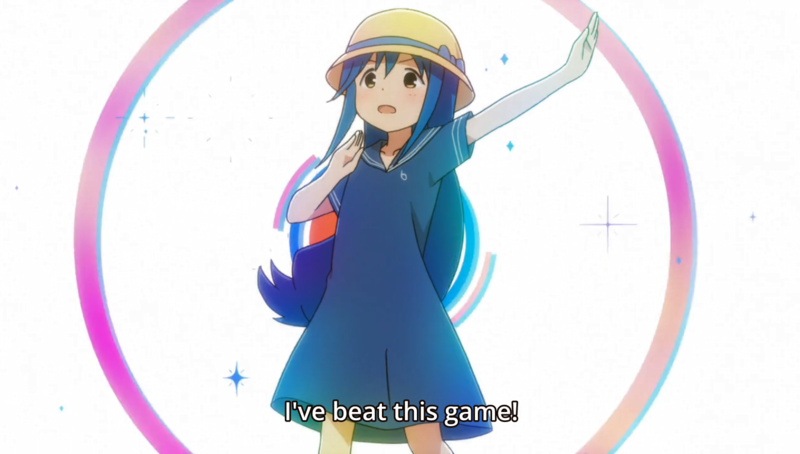 She even has a catchphrase, “I’ve beat this game!”, since she is usually the one who ends up solving the problems and mysteries that they find in the town. 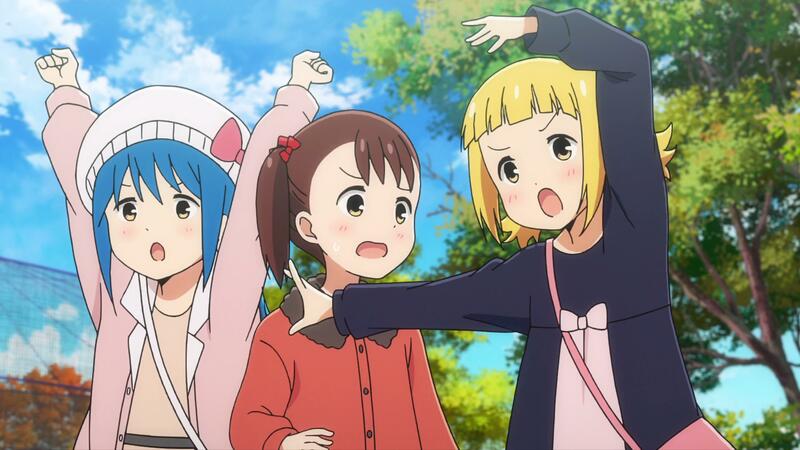 Other than these three, we can also follow their interactions with other characters, who make the show a lot funnier and more interesting. We have Saito, a police officer in the town. Although he’s annoyed with the kids, he tries to put up with them and play with them whenever they disturb him (which is honestly quite often). …Although in one way or another he’d usually end up losing. We also have Daigorou, or as everyone calls him, Oyaji. 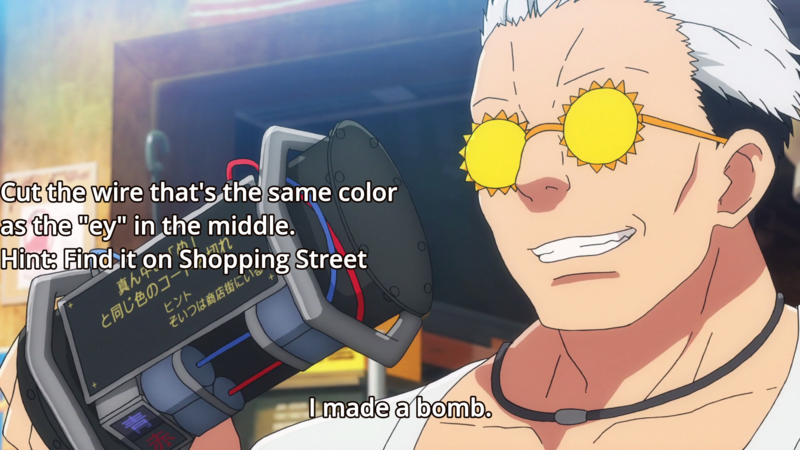 He gets along well with Colors, and often helps them out and gives them a lot of unusual items and gadgets (I mean, a bomb and a rocket launcher, really?) that they end up playing with throughout the day. He also has a seemingly unlimited collection of glasses, since he has never had the same pair worn whenever he’s shown in a scene. As we follow the extremely fun and likeable cast, we are shown breathtakingly beautiful background and sceneries, adding to the experience of looking back to our childhood, when we were just amazed with anything we would see around us. 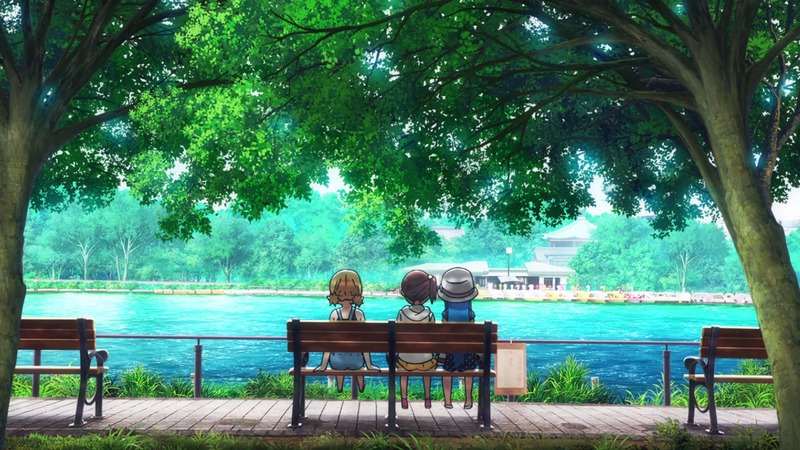 Overall, I think that the show is really good when you need something to watch as you chill and relax, or when you’re feeling nostalgic. 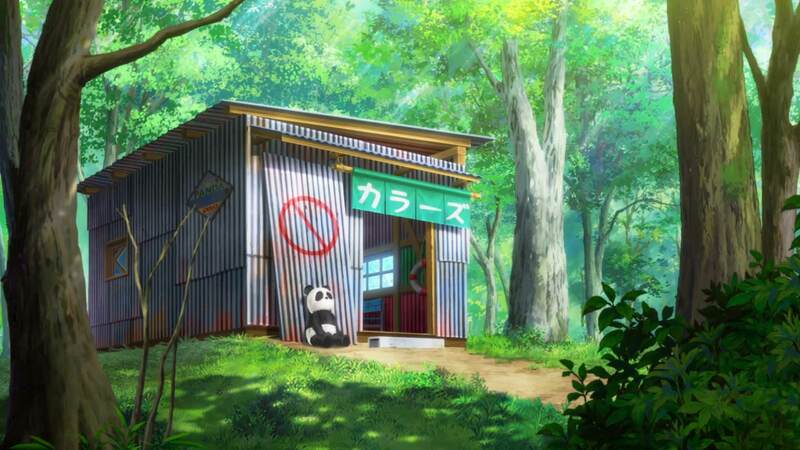 It is a completely peaceful and worry-free show which presents to us the endless ways of having fun as a child.